Apple released iOS 5.1 last week and if you’re already on 5.0 or 5.0.1 this update will come to you automatically, through the air. You’ll be asked whether or not you want it– the answer should be “yes.” Be sure your iPhone (or iPad or iPod) is connected to a charger, and on a WiFi network, and then go for it. Here’s what you get when the update is finished. Actually, you’ll get more than this, but this is the stuff that I find most interesting. 1. Photos can be deleted from your Photo Stream. In case you don’t know, Photo Stream is one of the things you get with an iCloud account. Take a picture with your iPhone (or iPad, or iPod touch) and the picture goes up to iCloud and back down to your other devices, including your Apple TV and your Mac (assuming you’re on 10.7 or higher). It’s a neat feature but until iOS 5.1 you couldn’t delete anything from the Photo Stream. You had to wait 30 days for the item to fall off the back end of the Stream. Not anymore. After updating to 5.1 you can view the Photo Stream on any of your devices and delete pictures from it. That’s the good news. The bad news is, when you delete a picture from the Photo Stream, it is only deleted from the device you’re working with. It doesn’t get deleted on your other devices. That’s a drag, because it’s not what most of us wanted. We want to delete a picture from the Stream and have it disappear from all of our devices. Maybe in 5.2. 2. You can get to the Camera app from the lock screen a little bit more quickly, thanks to a shortcut that’s more obvious than before. When you wake up your device you’ll see a camera icon at the bottom right (this used to show up only if you double-clicked the Home button of a locked iPhone or iPod touch). If you touch the camera icon it will slide up just a little, then fall back down. Do this enough times and you’ll think it’s broken, but it’s not: what they’re trying to do is give you the idea to shove the camera icon UP. Do that and you’re right into the Camera app, no muss, no fuss. This only works on the iPhones (4S, 4, 3GS) and the iPod touch, so there’s nothing here for iPad users. The red arrow shows you how. 3. Redesigned Camera app for the iPad. They moved the shutter button to the right side, where it’s easier to touch. A giant improvement. 4. Better battery life. We’ll see about that. They said the same thing about iOS 5.0.1. 5. Bug fix for a problem that caused the audio in phone calls to get garbled after half an hour or so. I had this problem before the fix and haven’t had it since so I think they nailed it. Thank you, Apple. 6. “Updated AT&T network indicator.” That’s a quote from Apple’s release notes for 5.1. 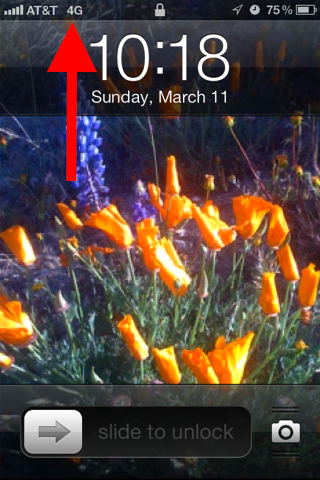 What it means is, after the upgrade to 5.1, your iPhone 4S will show a “4G” at the top left where it used to show “3G.” Did your iPhone suddenly get faster? No. It just means that AT&T thinks that their 3G network is nearly as good as a “real” 4G network, and with loopholes in the 4G specification, they are able to simply rebrand what used to be AT&T 3G. The International Telecommunications Union-Radiocommunications Sector (ITU-R) is the outfit in charge of specifying what 3G and 4G are, and they were a little imprecise about what a network has to be before it can be called 4G. They should have been more strict. Write your congressman. 7. Camera face detection now highlights all detected faces. It draws a faint green box around all faces in the picture you’re about to take, then focusses and sets exposure for the average of every face it finds. As far as I can tell the focus and exposure was happening before the 5.1 update so this is a cosmetic fix more than a functional one. 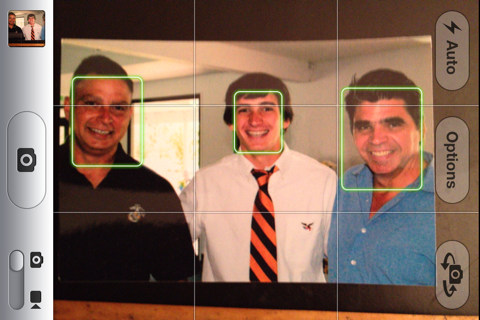 Shown below: a screen shot of what it looks like when the face detection finds faces. I was taking a picture of a printed photograph which was a little out of focus. If I’d have been photographing people instead of a picture of people the iPhone would have been able to focus on their faces, not just draw green boxes around them. You get all of that, and a little bit more, and it’s free. Go get it.